Combine flour, the 1/2 cup sugar, baking powder and salt. Beat together egg and vanilla and add to flour mixture. Fill 8 1/2-inch square pan 2/3 full with sliced apples. 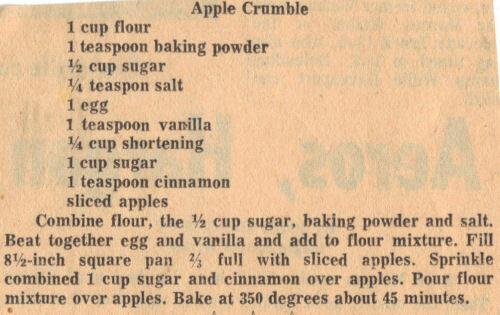 Sprinkle combined 1 cup sugar and cinnamon over apples. Pour flour mixture over apples. Bake at 350 degrees about 45 minutes.